If your idea of making a nice cup of herbal tea is to pop a tea bag in a cup of hot water and let it work its magic, you are not alone. Many people enjoy commercially prepared herbal tea blends purchased in the grocery store. But, you don’t need to rely on retailers for your supply of herbal tea. 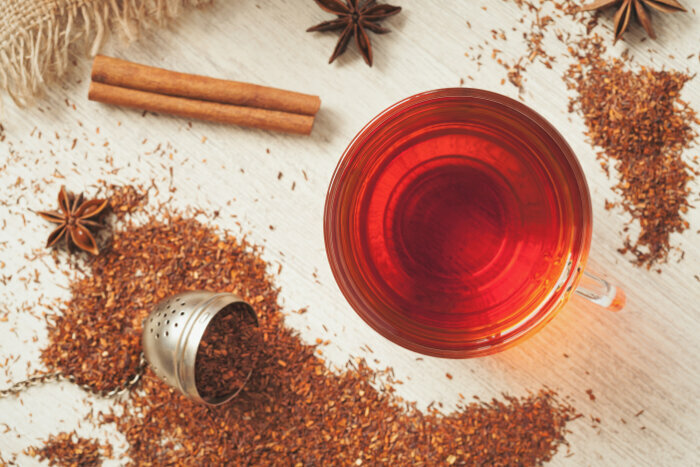 With a little effort and experimentation, you can blend your own herbal tea from scratch. Should You Use Fresh or Dried Herbs? You can use either fresh or dried herbs for making homemade tea. In fact, many people enjoy growing their own herbs at home and using them fresh during the summer, and drying the surplus for winter use. Fresh herbs take a little longer to steep as their flavor and oils are not as concentrated as the dried versions, but many say the flavor is enhanced. Making your own herbal tea from fresh herbs can be a rewarding and aromatic experience. Where Do Your Find Herbs for Making Herbal Tea? Where you get your herbs for making herbal tea depends on your needs. Check out these options. Grocery Store: You can find commercial tea blends in your grocery store in the coffee and tea aisle. These are often labeled to relax, uplift, detox or energize you. If you just want a quick cup of tea to relax at the end of the day, go ahead and buy herbal tea blends in tea bags at your grocery store. Look for brands you trust. Health Food Store: You can often find an assortment of herbs suitable for making herbal tea at health food stores. They may be sold as tea blends or as loose herbs. You may even find natural or organic herbal tea bags tucked into the herbal tea aisle in the health food store. Farmer’s Market or Produce Stands: You can often find fresh herbs at the farmer’s market or at local produce stands. You may also find them in the produce section of your supermarket, but the selection is likely limited to culinary herbs such as basil, oregano and chives. Grow Your Own: Herbs are generally easy-to-grow. You can pot seedlings from the nursery in big pots and grow them on a sunny deck or patio, or you can plant them in the ground in a sunny location. Nearly all herbs require full sun for 6 to 8 hours a day, with all-day sun being preferred. Most are drought tolerant and require little care other than harvesting the flowers and leaves. You can use any culinary herbs or edible flowers for making tea at home, but some taste and smell better than others. If you enjoy drinking herbal tea for the sensual experience, choose herbs that produce the flavor and aroma that appeals to you. 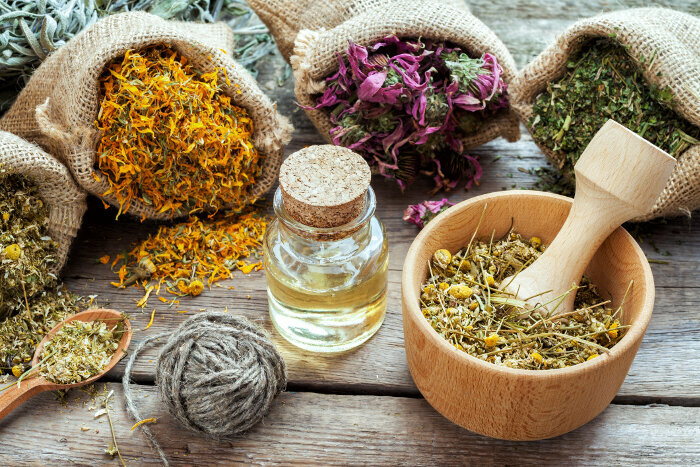 If you prefer to evoke the medicinal and spiritual properties of the herbs, refer to the healing properties of different herbs. To get you started, here a some common herbs used to make herbal tea and their healing or spiritual properties. How Do You Make Herbal Tea? You can make herbal tea by steeping dried or fresh leaves and flowers in hot water. While you can concoct your own blend of herbs for the tea, starting with a base of black, green or white tea and adding herbs to get the flavor you prefer is a good starting point for beginners. Follow these steps for making herbal tea. Measure one teaspoon of black, green or white tea per 6 ounces of water and place it in the teapot. Choose secondary herbs based on their medicinal properties or on their flavor and aroma. Chop fresh herbs into coarse pieces and mix the combination of herbs in a small bowl. Add one teaspoon of mixed herbs per 6 ounces of water to the teapot. Bring a kettle of water to a boil and allow it to cool slightly. Pour the hot water into the teapot and allow the herbs to steep for 3 to 5 minutes. Strain the tea and pour it into individual cups. Sweeten with sugar, honey or sugar substitute. Some people find a glass of herbal iced tea a refreshing change from hot tea. To make your own herbal iced tea, add your sweetener to the warm tea and allow it to cool. Serve it over a glass of ice. Try a slice of lemon or a few mint leaves to give the iced tea a splash of color and to enhance its flavor and aroma. Don’t be afraid to experiment with herbs to come up with your own private blend. You may be surprised with how the flavors of your herbs blend together to create a unique flavor.